RRResearch: I've never posted about quorum sensing? About 5 years ago I wrote an opinion piece suggesting that the widespread phenomenon of bacterial quorum sensing had been misinterpreted. Everyone had been assuming that bacteria secrete small autoinducer molecules and detect the concentration of these because this lets them estimate population density and thus predict the utility of investing in cooperative behaviour that benefits the whole population. Such behaviour is costly to individuals, and in populations containing such cooperators, individuals will do better by cheating (sitting back and letting others do the cooperative work). The difficulty of explaining how cooperation could evolve in the presence of cheaters is a serious problem for this 'quorum sensing' hypothesis. But most microbiologists have at best a very superficial understanding of evolution, and the appealing assumption that bacteria use autoinducers to talk to each other and act cooperatively spread like wildfire. My radical suggestion (Redfield 2002, Trends in Microbiology 10: 365-370) was that bacteria instead secrete and detect autoinducers as a method of determining whether the benefits of secreting more expensive effector molecules will limited by diffusion and mixing. For example, it would be a waste of resources to secrete degradative enzymes such as proteases if they are going to immediately wash away. This 'diffusion sensing' proposal was welcomed by at least some evolutionary biologists but resolutely ignored by almost all microbiologists working on quorum sensing, I suspect because it removed the glamour from their research. They used the bacterium Pseudomonas aeruginosa, which uses autoinducer secretion to induce production of a protease (among other things). They grew these bacteria in a culture medium whose major nutrient was a protein called BSA. Bacterial cells can't take up intact protein, but wildtype P. aeruginosa can grow well on the amino acids released when the protein is degraded by the protease it secretes. 1. They showed that mutant cells unable to produce the protease grew poorly in BSA medium, reaching only about 1/3 the cell density of wildtype cells after 24 hr. These mutants had normal protease genes but either could not produce or could not detect the autoinducer signal, so they could not turn this gene on. Their ability to grow at all in this medium was because they still could produce other proteases. 2. They showed that the mutants could grow fine if either autoinducer or protease were added to the medium. This confirmed that their poor growth was because of their regulatory defects, not some other factor. 3. They showed that the mutants grew fine on rich medium containing lots of amino acids where the protease was not needed. In fact the mutants grew better than the wildtype cells, which the authors logically interpret as being because they did not waste resources producing a protease they had no use for. They confirmed this by adding autoinducer to the cells that couldn't make their own - as predicted, this caused them to now grow poorly, presumably because they were now producing the expensive protease. 4. They then showed that the mutants acted as 'cheaters' when they were mixed with wildtype cells and grown in the BSA medium. 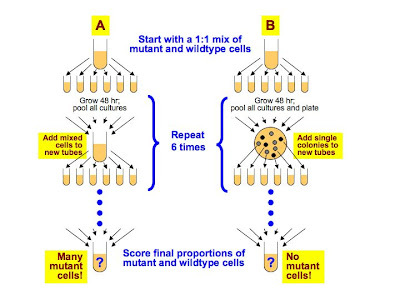 Cultures that began with only 1-3% mutants had >40% mutants after 48 hr growth. The mutants outgrew the wildtype cells because they didn't expend resources making the protease. They got all the amino acids they needed because the wildtype cells around them produced protease. They thus prospered at the expense of the wildtype 'cooperators'. This is not at all surprising given the also-unsurprising results in points 1-3 above. The mutants never took over the cultures, because their advantage depended on the cultures also containing lots of wildtype cells. "Our results show that quorum sensing is a social trait, susceptible to exploitation and invasion by cheats. Given this, how is quorum sensing maintained in natural populations?" "The most likely explanation is kin selection - if neighbouring cells are close relatives they will have a shared interest in communicating honestly and cooperating." What? No mention of the by-far more likely explanation that autoinducers exist mainly for a cell-autonomous function (diffusion sensing) that is not subject to cheating? This is the first big problem with this paper. The other big problem is that the experiment that they claim tests kin selection is really just a repeat of the growth experiments they did in point 1 above. Here's a diagram of the experiment as it is described in their Methods section. Treatment A (on the left) is a 6-cycle repeat of the mixed culture experiment described in point 4 above. In each step 12 tubes of mixed culture (only 6 are shown) were pooled together after 48 hr growth. This mixture was then inoculated into fresh tubes for another 48 hr growth. So the mutant cells (potential cheaters) were always growing with wildtype cells that produced the protease the mutants needed. It's not surprising that, at the end of 6 cycles of this mixed growth the culture still contained about 35% mutants. 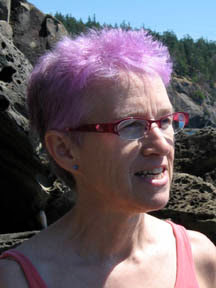 Treatment B is claimed to provide conditions that allow kin selection. But after the first cycle it's really just a series of pure-wildtype or pure-mutant cultures like those described in point 1 above. This is because, after the overnight cultures were pooled, the cells were grown into single colonies on an agar plate, and a different colony was used to inoculate each new tube for overnight growth. So each of these tubes contained a pure clone of either a mutant or wildtype cell. As the cultures in point 1 showed, the mutant cells grow poorly when they have no wildtype cells to provide protease. It's not surprising that, at the end of 6 cycles, all of the 12 cultures are wildtype. I did the calculations and this is exactly the result predicted by the differences in growth seen in point 1. The experiments are competently done and the data looks very solid. But to have gotten this into Nature the authors must both be masters of spin and have had very inept reviewers. So why am I blogging about this? Partly because the authors are pushing an unjustified conclusion, and partly because I'm very annoyed that they completely ignored the point of my 2002 paper, even though the senior author and I have discussed it in some detail when he visited here last year (he gave no indication then that he thought I was wrong). Worse, the authors* do cite this paper, but for something it doesn't actually contain (evidence that cheaters can invade quorum-sensing populations). I suspect that a not-totally-inept reviewer told them that they should cite me, and they avoiding having to discuss the diffusion-sensing explanation by citing me for something I didn't do. *One of the authors has emailed me expressing dismay over the harsher term I originally used, so I've changed it. Rosie asks “No mention of the by-far more likely explanation that autoinducers exist mainly for a cell-autonomous function (diffusion sensing) that is not subject to cheating? I ask: So what would be your explanation of the evolution of QS based on diffusion sensing? Rosie says that their evolution experiment is just a repeat of their growth experiments. I agree, but things are even worse. Using their “kin selection” treatment, any trait that increases productivity, such as ara+ vs. ara- in medium containing arabinose, would increase in frequency. True, what is different with the ara example is that the ara+ would also take over in the “mixed” treatment (i.e., the ara- is not a ‘cheater’ that exploits the ara+). Nevertheless, the reason that ara+ would take over in the “kin election” treatment is exactly the same as the reason for why “wild type QS” takes over: in this treatment, the more productive strain is, by experimental design, allowed to make a bigger contribution to subsequent generations simply because of its higher productivity. The only thing that this treatment tests is the handling skill of the experimenter! However, the authors not only feel compelled to invoke kin selection theory, a subject on which hundreds of papers have been written, to explain this absolutely trivial result, but they also claim that kin selection is the “most likely explanation” for this result. That’s nonsense: it’s like breaking a butterfly on a wheel, and then claiming that that’s the only way to break a butterfly. Of course, as Rosie mentioned, they have gotten away with this in the past, so it’s perhaps natural for them to try the same trick again. But what I find hard to understand is that they themselves don’t seem to be on to the triviality of their results. In support of their “theory”, they mention two things. First, they mention that QS cheaters have been found in natural populations, and that they are mostly of the “signal-blind” variety. I don’t see how this supports their “kin selection” theory. Re: "My radical suggestion (Redfield 2002, Trends in Microbiology 10: 365-370) was that bacteria instead secrete and detect autoinducers as a method of determining whether the benefits of secreting more expensive effector molecules will limited by diffusion and mixing. For example, it would be a waste of resources to secrete degradative enzymes such as proteases if they are going to immediately wash away. This 'diffusion sensing' proposal was welcomed by at least some evolutionary biologists but resolutely ignored by almost all microbiologists working on quorum sensing, I suspect because it removed the glamour from their research." Can you also explain this in terms of other QS phenomena, such as competence and bioiluminescence? Of the very large number of processes regulated by secreted autoinducers, competence and bioluminescence are probably the ones whose evolutionary functions are least well understood. This is likely why we don't fully understand the logic behind their regulation. Bioluminescence is even more mysterious. We still don't know why bacteria have pathways that emit light - the ability to light up squid is clearly not the main reason. Once we understand this we may see why it is controlled by autoinduction. Why do you say that to light up squid is clearly not the reason. I thought Ruby, McFall-Ngai (sp?) etc had shown some pretty nice experiments suggesting that V. fisheri gets a pretty good deal, that there is cross talk between squid and bacterium, and that the squid is protected against predation. A pretty nice example of a mutualism, if you ask me. The best examples of QS are in environments were diffusion is limited by barriers. In soil, QS quenching by a robust set of flora may account for steep gradients of signal as well. My opinion is worth what you paid for it, but I like your diffusion sensing hypothesis. What I don't see is any reason why either one must be exclusively true. There seem like many situations where either effort might pay off, in different contexts. For example, in a biofilm, diffusion conditions and cell density may be connected by the level of EPS secreted, so sensing either gives info on the other. I haven't read the Diggle paper, but there is a group at OSU that is studying QS cheaters as well, from an evolutionary biology basis. I forgot the name, though! As an aside, I'm a big fan of the blog, and think open research is fantastic!